Commercial line of dehumidifiers will keep your construction and restoration projects on schedule and on budget by decreasing drying time and increasing production time for interior finish work. Features include high impact rotomolded housing, lightweight integrated design and greater moisture removal at lower temperature and relative humidity. The compact machine design allows for both horizontal and vertical stacking capabilities for optimal storage. Low grain refrigerant system removes more moisture from the air than conventional refrigerant systems. Low temperature operation to 40 °F continues to remove moisture from the air at colder, yet humid conditions.Tough rotomolded cabinet withstands the rigors of operation, making this machine extremely rental friendly.Electronic controls allow for convenient, quick setup and simple operation with no knobs or buttons that can easily be damaged in transport or on the job.Digital hour meter, for recording job times, comes standard with back up battery unit to ensure the meter can be read even if the unit is unplugged.Features 300 CFM blower to efficiently move more humid air through the system, delivering increased air changes per hour.Integrated handles, both upper and lower, allow for easy lifting and moving and reduces the need for replacement parts.Twin 5 inch rear vents allow the warm, dry, processed air to be vented out or ducted with optional 10" layflat or 2" x 5" sections of ductwork, to aid in drying area.Unit is CSA approved. Low Grain Refrigerant Dehumidifier The Dryvex™ commercial line of dehumidifiers will keep your construction and restoration projects on schedule and on budget by decreasing drying time and increasing production time for interior finish work. The AD 115LGR features include high impact rotomolded housing, lightweight integrated design and greater moisture removal at lower temperature and relative humidity. The compact design of the AD 115LGR allows for both horizontal and vertical stacking capabilities for optimal storage. 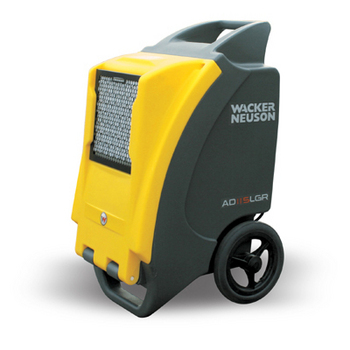 The entirely new Wacker Neuson AD115 LGR decreases drying time, so you can quickly complete the job. Featuring low-grain refrigerant technology, the AD115LGR draws more moisture from the air, even at temperatures reaching 40° F. Its durable and compact design includes integrated lifting handles for easy lifting, transport and storage.The new AD115 LGR quickly dries flooded structures and is the right choice for finish work at the construction site. Bullet-proof design, backed by Wacker Neuson service and nation-wide distribution support.